Sign up to the free Bonjour Paris newsletter to get all the best Paris related content and competitions sent directly to your inbox. Find out more. 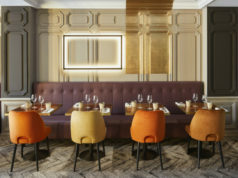 Luxury boutique hotel Pavillon de la Reine has opened its long-awaited, first-ever restaurant, offering guests a new experience at the hotel and visitors the chance to sample some of the finest French food in Paris. Built in 1612 by King Henry IV and located in a private garden courtyard just off the beautiful Place des Vosges, Pavillon de le Reine takes it name from Queen Anne of Austria, who once stayed in one of the wings. The hotel has once again honored the Queen– known for her love of fine food and wine– with the opening of Restaurant Anne. 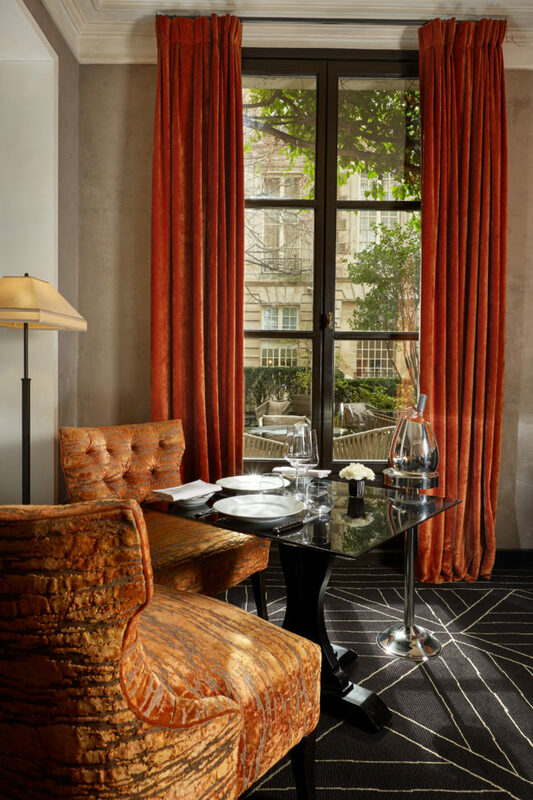 The restaurant can be found on the ground floor, in the hotel’s private library salon and looking out onto the leafy private courtyard. With a mix of armchairs and banquettes inviting you to dine at leisure, and a rich color palette of warm reds and burnt orange, deep woods and soft velvets, the space is cozy but sophisticated, and the atmosphere is surprisingly relaxed. 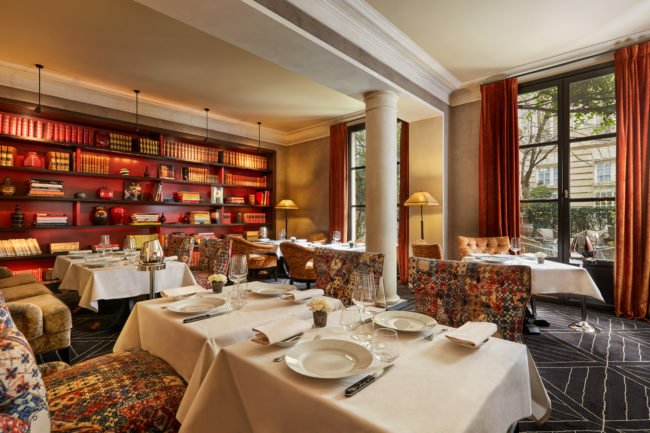 With large mirrors, low-lit lamps and shelves stacked with fashionable tomes and old novels – notably the works of Victor Hugo who once lived on Place des Vosges – and just a handful of tables, the room feels more like a Parisian apartment than a formal restaurant, giving an ‘at home’ feel rarely found when fine dining. 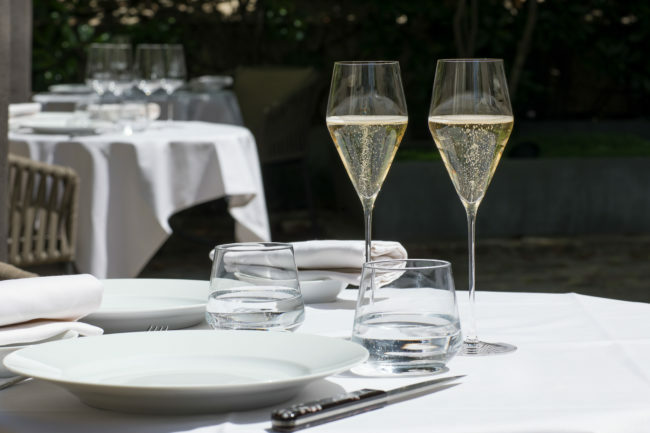 The terrace is also open for dinner and also has its own air of exclusivity – finding a table on a terrace in Paris is notoriously difficult during summer, but here you have your own private courtyard hidden away. 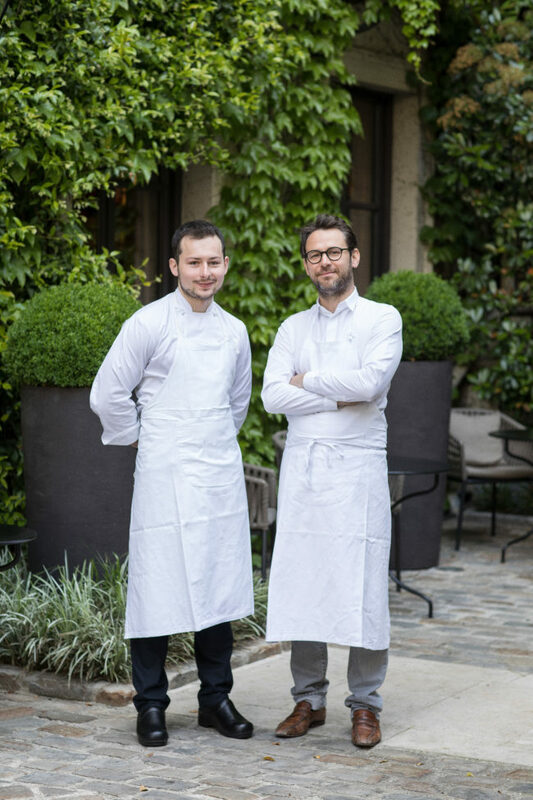 Pavillon de la Reine has called one of Paris’s most exciting young chefs, Mathieu Pacaud, for the new venture. Already the head chef of three-Michelin star L’Ambroisie alongside his father, Bernard Pacaud, Mathieu also runs the Michelin-starred kitchens of Apicius and Divellec, as well as La Table de la Ferme, in Corsica. 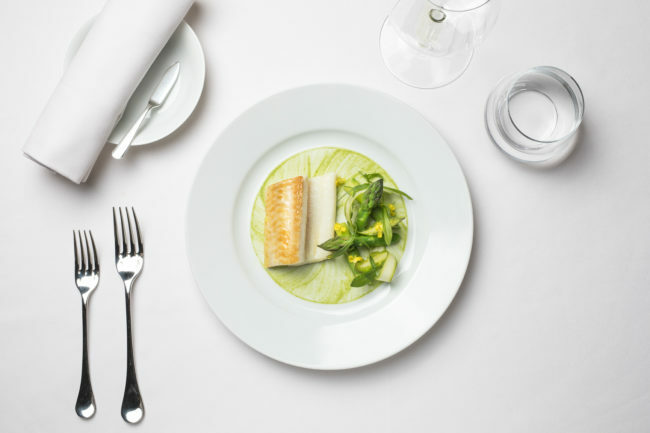 He now brings his talent and savoir-faire to Restaurant Anne, adding a creative twist to the French classics. Bringing Pacaud’s menu to life will be young head chef Edouard Chouteau, who also brings a wealth of experience of French cuisine and produce to Restaurant Anne, having worked in the prestigious kitchens of Michelin-starred Le Bristol, Pierre Gagnaire and Arpège. Pacaud’s menu is a concise collection of French dishes which will change with the seasons and the chef’s own inspirations, and celebrates the best of French produce; butter is sourced exclusively by the renowned Terroirs d’Avenir, entrecôte has been chosen from Salers cows, the blue lobster is from the shores of Bretagne, and the strawberries are some of the best in France, la Gariguette. Pacaud and his team have also added unexpected touches to each dishes to add both flavor and an element of surprise. Everything is also handmade, from the butter – which has been unusually flavored with lime – to the crusty rolls of bread and baguettes which are baked by the team just before service. Also expect a variety of appetizers, which set the scene – and the portion size – for a long, leisurely and very indulgent dining experience. 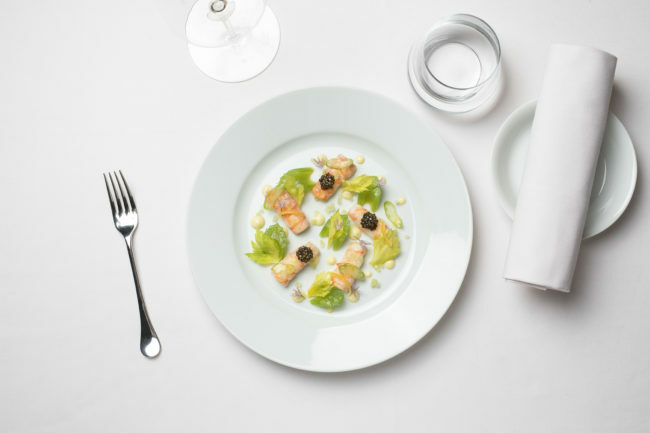 For our starters our large and meaty langoustines were just as described, lightly cooked beautifully tender, and perfectly accompanied with finely sliced celery to add a contrasting bite. The emulsion with soft white cheese and lime zest seemed an unusual addition to seafood, but was flavorful without being overpowering. The savory tart was a true celebration of fresh, seasonal summer vegetables bursting with flavor, and laid upon a buttery, crumbly pastry base. Our entrecôte de Salers was incredibly tender and cooked to perfection, accompanied by a béarnaise sauce that had been whipped up to be as light as air and gained the strong approval of my French dining companion, while the side dish of pommes de terres soufflees was one of Pacaud’s unexpected surprises, little discs of fluffed up potato with a crisp exterior which popped. Vegetarian options are limited on the menu itself, but don’t let this deter you from visiting. Not only are the restaurant happy to accommodate, but Chouteau himself personally came to our table to greet us and talk us through his vegetarian proposal. His creation was so delicious he then had to pay us a second visit to satisfy our curiosity as to how he had created such a rich vegetarian stock. 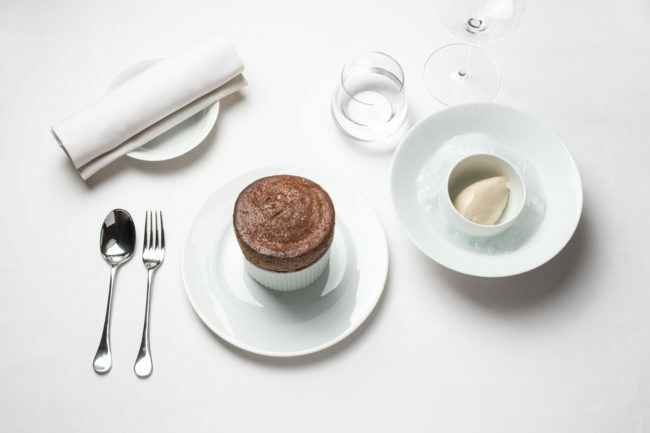 For dessert, do not miss the chocolate soufflé, a signature dish of Mathieu Pacaud and also another nod to Queen Anne of Austria, who had a passion for chocolate. Rich, silky, and very indulgent, you may be asked to share once it arrives. Gariguette strawberries with olive oil, passion fruit, and homemade sorbet is a lighter, fresher option, while the dessert du jour will offer a very pleasant surprise no matter how many times your return. For those interested in French wine, the collection has been selected by expert Gabrielle Vizzavona. Vizzavona has hand-picked family-owned suppliers for their approach to winemaking – working with the terroir to produce wines that reflect their particular region – as well as to offer the perfect pairing with Mathieu Pacaud’s cuisine. With a selection of rare vintages and bijoux wines, the menu will surely have something for everyone, including the connoisseurs. 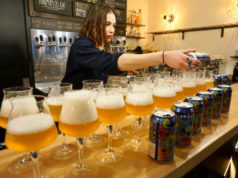 Vizzavona has also worked on the hotel’s honesty bar menu, offering a range of spirits and liquors for all palettes, and mainly produced by French micro-distilleries. Guests are welcome to relax with an after-dinner digestif or cocktail in the lounge just next to the restaurant, another of the hotel’s cozy but elegant hideaways and a perfect end to the evening. Restaurant Anne re-opened August 29th for lunch and dinner Wednesday to Saturday, and for Sunday lunch. A la carte menu from 68€. Tasting menu priced at 95€. Nicola Leigh Stewart is a travel journalist who after living in London and Madrid has finally settled in Paris. She now spends her weekends exploring France to report on the best luxury hotels and must-visit destinations. You can follow her travels and experiences on Instagram @nicolaleighstewart. Thank you for the recommendation. The food was great, and the service and ambiance were wonderful. If you're here, we suspect that you love Paris and France as much as we do. Online since 1995, BonjourParis.com was one of the first websites dedicated to publishing France-related travel content. 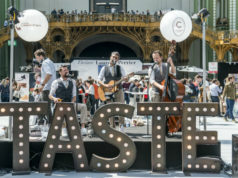 Sign up to the FREE Bonjour Paris newsletter! 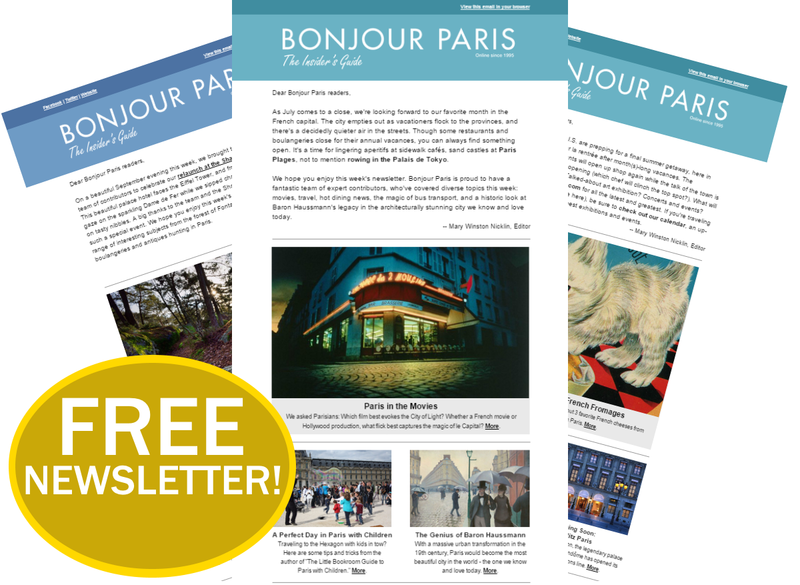 Enter your email address to get the free weekly Bonjour Paris newsletter sent directly to your inbox.